Few parents, even in the best circumstances, do not feel frustrated at times by the demands of raising children. But when parents are isolated, involved in difficult relationships, experiencing financial stress, or lacking information on child development and child-rearing techniques, they can lose control. Informed, effective child rearing builds strong communities by producing young people who work hard to create positive lives for themselves and those around them. Uninformed, ineffective child rearing jeopardizes the well-being of whole communities. Parent Support Services is a non-profit, volunteer-based society and registered charity founded in 1974. The mandate is preventing child abuse and promoting healthy parent-child relationships by supporting parenting, families, and communities. This is achieved by providing support and information to parents. The goal is building healthy communities, one family at a time. Click on any button below to view more information about each workshop or event. Where: at our office – 5623 Imperial St., Burnaby. Please note that limited childminding spaces will be provided for this session. If needed, please register yourself and your child(ren). With the financial assistance of the Government of British Columbia and United Way Lower Mainland. 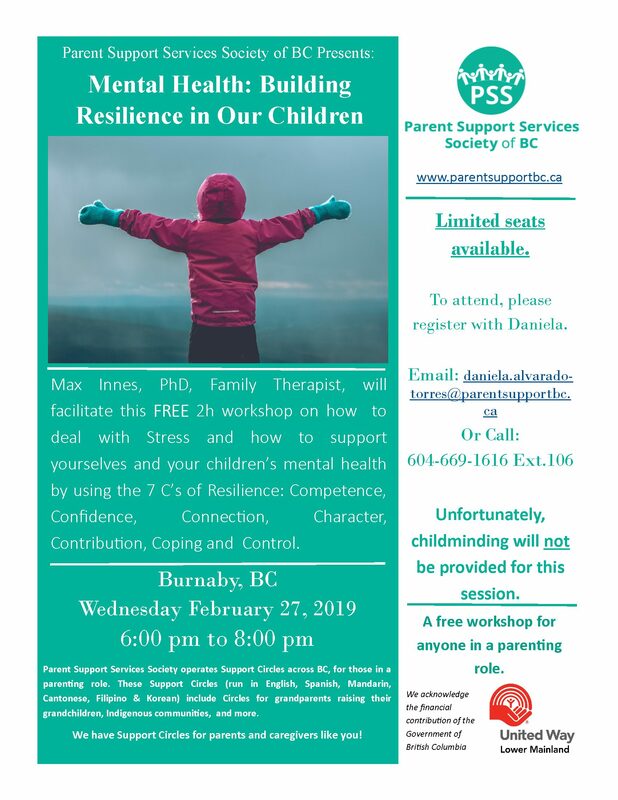 Mental Health: Building Resilience in Our Children – Wed. Feb 27, 2019 6-8 pm Burnaby. 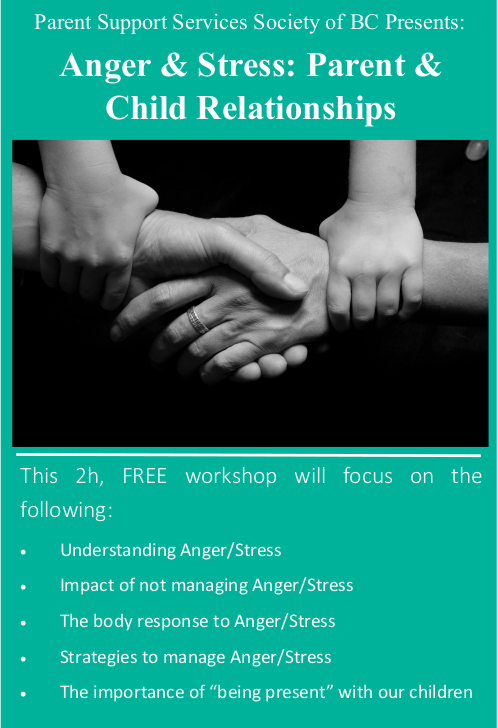 This FREE 2hr workshop looks at stress and how to deal with it to support you and your children’s mental health. It also covers the 7 C’s of Resilience: Competence, Confidence, Connection, Character, Contribution, Coping, and Control. Workshop is led by Dr. Max Innes – a Clinical Fellow and Approved Supervisor of the American Association for Marriage and Family Therapy. Wednesday February 27th , 2019 from 6:00 to 8:00 pm in Burnaby – Location will be provided upon registration. 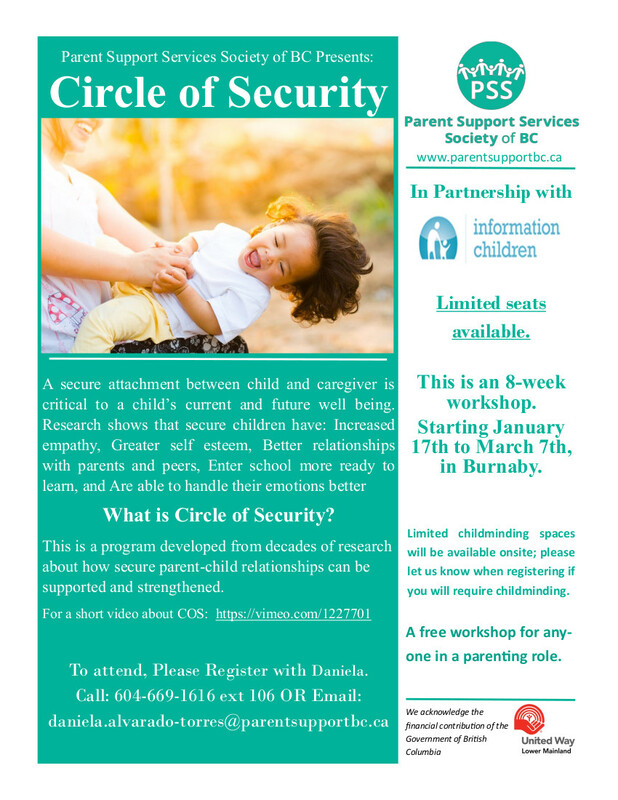 Circle of Security – Parenting Series January 17th – March 7th. This new year we have partnered with Information Children to deliver a FREE, 8-week Parenting Workshop on ‘Circle of Security’ (COS). Starting January 17th, this FREE, 8-week workshop will take place every Thursday from 10:30 to 12:30 through to March 7th; Free childminding will be offered. There a only 10-12 spots offered. This is a first come, first serve registration. Those whom are interested must take into consideration that attending all 8 sessions are requested, as this helps parents/caregivers understand the concepts of COS better. This workshop is best suited for parents/caregivers whom have children ages 0 – 12. What:This workshop will be led by a trained professional who will facilitate an open discussion on child development and the ‘when, why and how’ on communicating with our children about sexual health. Watch here for the next workshop. Parent Support Services Society of BC workshop on ‘Parenting & The Whole-Brain Child’ is facilitated by Dr. Max Innes, family therapist. He introduces an approach to parenting that focuses on providing practical ideas that are effective and in keeping with recent findings from neuroscience, child brain development, and behaviour. 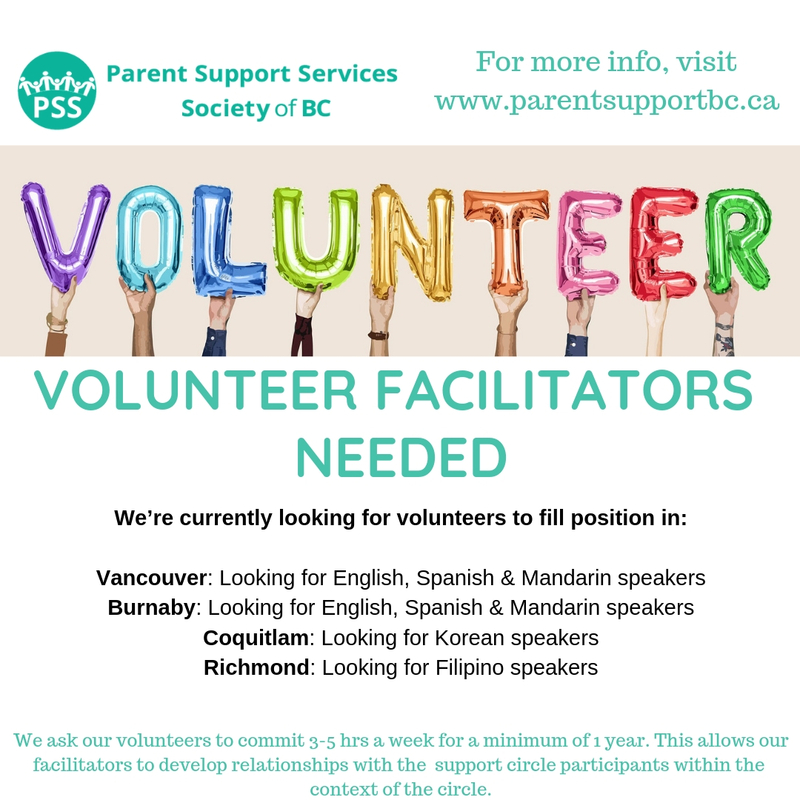 Our parenting Support Circles are for parents, grandparents, and other caregivers in different communities throughout BC. Our Circles are based on a self-help, peer support model which provides a safe space for Circle members to get together and discuss their strengths, challenges or concerns about their parenting role; builds a supportive network & skills; receives emotional support; develops self-advocacy skills; empowers and boosts self-esteem; and helps create a healthier living environment for all families. Blissful Parenting is a 2- hour workshop FREE workshop based on positive discipline techniques that can turn “bad” child behavior around immediately! This workshop is about learning simple and highly effective methods for improving communication with your kids and addressing problem behaviours. Workshop facilitator Chuck Anderson has an energetic and engaging presentation style that uses the latest accelerated learning techniques and a high level of audience involvement. 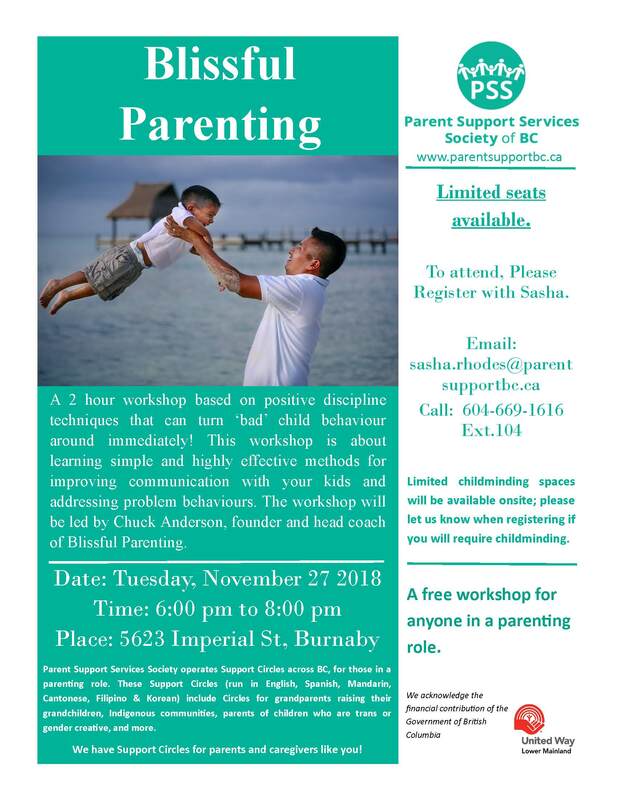 This training is specifically adapted to helping parents of children & teens deal with the many behavioural issues that come with the job of being a parent. Watch here for details on the next workshop. Family Justice Centres operate across BC to provide services to British Columbians going through separation or divorce. Each centre is staffed by accredited Family Justice Counsellors, specially trained to help families with parenting arrangements, contact with a child, guardianship, and support issues. They can help parents resolve disagreements without going to court. They provide short-term counselling, mediation, emergency and community referrals and other free services. 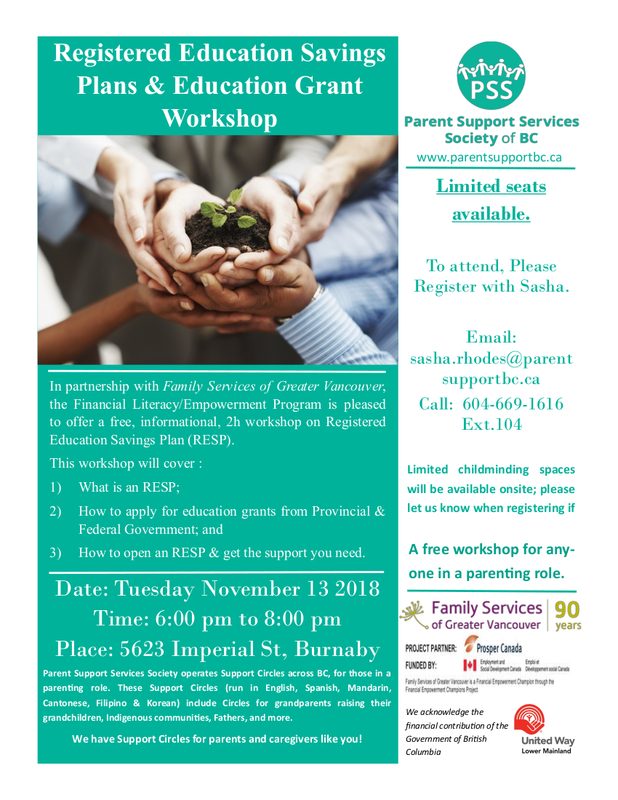 Click on the button below to view parenting workshops in Vancouver – when available.